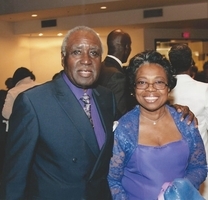 Provide comfort for the family of Walter McLean with a meaningful gesture of sympathy. Viewing & Services in NY are as delineated below. He will then be sent to his home state of North Carolina for a Final Service & Burial on Saturday April 6th, 2019. As he's being buried in NC, the family appreciates, if you're sending flowers, sending plants and/or vases are preferred; or you may send flowers to NC (see the NC funeral home info below). If plants/vases/flowers are sent in NY, these may be delivered on either Friday March 29th by/before 6:00pm, or Sat. March 30th 12:00 NOON latest, to Lee's Funeral Home. The Family Thanks You! Walter McLean Sr., 88, departed this life March 24, 2019. Born in Maxton, NC, he's a longtime resident of White Plains, though he would still split his living time there. 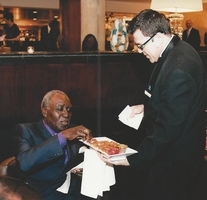 Employed by the City of White Plains for over 25 years, he then went into business for himself, serving others with his "McLean's Black Topping" business, thus his nickname "Black Top Man". He is survived by loving family in NY, NJ, & NC, and many friends all over. The Entire Staff of Lee's Funeral Home, LLC respects that the family of Walter McLean, Sr. entrusted the care of their loved one to us, and that they value the level of service & attention our funeral home provides. We are honored, in turn, to provide comfort, assistance and service to the family of Walter McLean, Sr. during their time of bereavement. As he's being buried in NC, the family appreciates, if you're sending flowers, sending plants and/or vases are preferred; or you may send flowers to NC (see the NC funeral home info below). If plants/vases/flowers are sent in NY, these may be delivered on either Friday March 29th by/before 6:00pm, or Sat. March 30th 12:00 NOON latest, to Lee's Funeral Home. The Family Thanks You! To send flowers in memory of Walter "Black Top Man" McLean Sr., please visit our Heartfelt Sympathies Store. Viewing & Services in NY are as delineated above & below. He will then be sent to his home state of North Carolina for a Final Service & Burial on Saturday April 6th, 2019. ~~~~~~~~~~~~~~~~~~~~~~~~~~~~~~~~~~~~~~~~~~~~~~~~~~~~~~~~~~~~~~~~~~~ As he's being buried in NC, the family appreciates, if you're sending flowers, sending plants and/or vases are preferred; or you may send flowers to NC (see the NC funeral home info below). If plants/vases/flowers are sent in NY, these may be delivered on either Friday March 29th by/before 6:00pm, or Sat. March 30th 12:00 NOON latest, to Lee's Funeral Home. The Family Thanks You! Repast will be immediately following 3:30pm service Saturday March 30th, 2019 at First Baptist Church in Elmsford, NY.